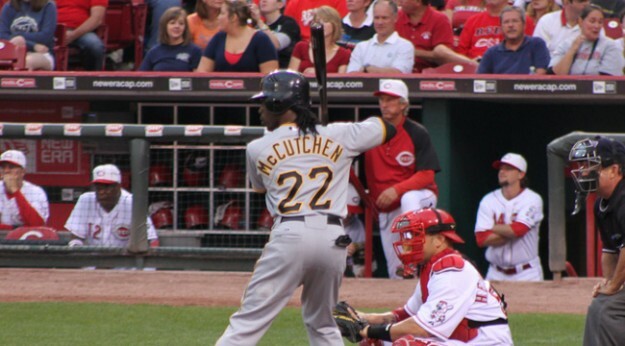 Faced with a tough decision, I chose Andrew McCutchen as the fourth overall pick in the draft. Set my hitting foundation within the first several picks, focusing on the four non-stolen base categories. Then sprinkling in some strong starting pitchers while rounding out my hitting with decent-BA, 20-20 type hitters. Then looking at SB and HR specialists, not worrying terribly about BA since I built that up earlier. Miggy and Trout both went ahead of Braun? I say you have to go with Braun first. Then you can debate about Miggy-Trout or Trout-Miggy. The fourth spot stinks. I don’t want to waste my 2b slot where I cound on steals later on the power-hitting Cano. It feels too early for Pujols or Votto. I’m not sold on those Rockies (Car-Go and Tulo) or Hamilton staying healthy. That leaves us with Kemp or McCutchen. McCutchen’s BA may drop, but I believe the counting numbers will hold steady (or just regress slightly). McCutchen was my pick by process of elimination! I love Kershaw and Verlander, but you need offense early. I don’t approve of SPs in Round 2, no matter how good they are. It sets you back too much. I was hoping for Wright or Beltre here, and both were available, so I went with Beltre. 3B can be a tough position after the top ones fly off the board, so I wanted to be set at that position early. There are man-crushes on Harper, Cespedes, and Adam Jones all across the country, so those picks are common in this part of the draft. I would have loved Pedroia here, but he went early. It felt like a good chance to end up with BOTH Wright and Beltre, so I pulled the trigger on Wright, thus cornering (no pun intended) the third base market. This draft happened before Headley and Hanley got hurt, obviously. I love Desmond here and was also hoping that I could continue my BA-HR-RBI run with Butler or Holliday, but I JUST missed out on them. I could have gone with Craig, but I couldn’t pass on King Felix with the ninth pick of the fourth round. My internet gave out for a minute and left me with Santana here as an auto-pick. Lesson learned: when drafting on the internet, ALWAYS have desired players in your queue. He was not part of my strategy, but in the end, he was not a terrible pick here. I personally would have preferred the elite BA of Joe Mauer, but I’ll take the power from Santana anyway. With no other players jumping out at me at this point, I went ahead and filled my second catcher position with another elite option. I like the Choo and Gordon picks here as well. Kimbrel is awesome, but I have no desire for a closer in Round 6. This one hurt (Teixeira), but that’s what happens when you draft on March 4. I like all of the other picks in this round, especially Freeman and V-Mart. That’s too early for Ortiz, given the inherent injury risk and DH-only eligibility. Looking at the asterisk, perhaps he was an unintentional auto-pick (always have some targets in your queue!). Davis, Rizzo, and Hosmer are three young, studly first-basemen. I probably should have kept building my power with Hosmer but instead got my starting shortstop. Looking back, I should have just taken Alcides Escobar in Round 10 instead. Round 9 is a great spot for Salvador Perez. He has a shot at matching Mauer’s stats but at a lower cost. I like trying to get a few 20/20 type talents around this point of the draft, so Rios was a logical choice at this point. I’m not a fan of a slap-hitting outfielder (Gardner) or middle-tier catcher (Lucroy) here. Many pitchers are now flying off the board, but this is a daily lineup league. I’ll take advantage of that with streaming pitchers later. I continue to build my offense with Neil Walker, one of the last “solid” second-basemen in my opinion at this juncture. Eaton was taken before he was injured, but even then, it felt high for him. I went with too much speed in this draft and left myself lacking in the HR & RBI categories. I should have taken Willingham or Konerko but instead took another slap-hitting SS in Aybar. I like Kuroda in Round 11. I like C.J. Wilson bouncing back this season. Rever will steal many bases for the Phillies. I went with a closer I feel comfortable with. No, he won’t be quite as good as he was in 2012, but he’ll certainly be good enough to earn this draft position. I’m not touching Crawford this season. I do like Moustakas and Konerko in this round. People seem to really like Rutledge, so if you like him too, this is probably where you need to take him. LaRoche and Morales are solid power sources in Round 13. I just missed them and took yet another speedster. I definitely have a surplus. Samardzija is a great source of strikeouts this late. People really like Estrada, I have noticed, as well. There’s no need to reach for him, though. I love catchers that won’t play catcher much during the season. Go Doumit! Round 14, starting pitching time! Welcome to my team, Anibal. I love his win potential with the Tigers. Morse is a good late power source in Round 14. Notice that a bunch of closers went off the board here. I waited a bit longer for saves after taking Rodney in Round 12. I love how Bailey pitched down the stretch last year. Marte is intriguing. I’m not sure about waiting for Myers in a standard roto league, but in Round 15, I can’t call it a bad pick. Power becomes scarce in Round 16, so I’m hoping for 20 homers from Ethier. Cain and Segura are good upside picks. I worry about a breakdown from Beltran. With most of the best closers now off the board, I took a shot with Betancourt in Coors. Lynn and Becket should return the Round 17 investment without a problem. Fowler is a good 15-15 possibility late. I like snapping up saves late. Cishek should get 25 at least. Avila is a solid Round 18 catcher. I can’t stomach a potentially horrific BA from Dunn. Swisher is nice here, though. I’m out on Marcum and Hanson this year. I took one more shot at some saves with Balfour. Hudson lacks Ks but is a nice ERA and WHIP booster in Round 19. I wanted Cobb but settled for Garza. He’ll be fine, especially with the injury discount! Parnell is nice at this point. Plouffe offers excellent power for Round 20, and Hamilton HAS to steal at least 20 bases if not 30 or more, right? I wanted to keep building up my strikeouts, so Dempster was the choice there. No picks really impressed me in this round. I was happy to get some more power late in Kubel. It will be interesting to see what Domonic Brown turns into this season. I was already loaded with speed, but you can never have too much, so I grabbed Crisp. Pierre and Venable offer more speed here, too. I used the rest of the draft to take starting pitchers that I could stream in based on matchups. Cahill was first in line. Everything else in Round 24 was pretty vanilla. Looking back post-draft, I should have taken McCarthy over Hughes. If two starting pitchers are similar, it’s generally a better idea to go with the one in the NL. Not much to say about this round. I thought Vargas was the best starting pitcher available. A healthy Garcia has a shot at doing some damage (in a good way). If he gets hurt, I have no problem dropping a Round 27 pick. Reynolds and Jones offer good power very late. McDonald is still young and has a chance to become more consistent. Lewis could do well when he returns to the mound later in the season. That’s a nice lottery ticket. Maholm could pick up more wins with the Braves than he did with his past teams. Ramirez was a good pick this late. I’m too heavy on the steals side and light on the power side, but I believe I accomplished my goals of having enough batting average in my offense. I’m happy with my saves on the pitching end, and with daily lineup changes, the starting pitchers I drafted should have me covered well enough until some free agents get hot enough to use. I like the chances of my team contending despite the early loss of Teixeira.